Your blog says you’re currently taking time out to recoup and recover from temporary blindness and paralysis – can you tell us a bit about that, and its effects on your life and things you have a passion for? In October of last year I noticed that my sight was getting quite bad. I put it down to needing a new prescription, as I used to wear glasses for reading and computer work, and so I decided that I would take myself to an opticians nearer payday… however, my eyes didn’t allow me the pleasure of waiting until the end of the month! I lost my vision literally over night. I was staying with a friend in South London as I had a gig to play in Islington the next day when it all happened. I collapsed in the local high street and had to be carried to the local A&E as the ambulance would take 40 minutes to get to me. Within minutes of losing my vision I lost my hearing and then the use of my legs. Anyway, to cut a long story short, I was kept in hospital for quite a while, unable to see or walk but thanks to friends and family visiting from all over the country I got through it and was able to leave the luxurious St George’s Hospital and recover at home, by the sea. It had a huge affect on my life, though at first because I was on such a heavy dose of steroids I don’t think I really knew what was going on. I changed horrifically as a person; I went from being a happy, giggly, and people loving to wanting to be left in silence without company. When my hearing returned I didn’t find any feeling in music at all. When I listened to it I felt empty, which is the complete opposite to how I normally feel about the things I love. Thankfully all that is changing now. I’m happy to say I’m off the steroids and am feeling a great deal better about life. How long have you been writing music for? – Gosh, at least 6 years. At least, I think so… I’ve been making music for as long as I can remember, whether that be bashing out beats on up-turned saucepans (much to my mothers dismay!) or taking a toy harmonica in to primary school to get the playground jigging and whirling about at playtime! You’d built up a steady momentum before this happened – played Glastonbury and were becoming a familiar face in the London scene. How do you think the last 10 months without performing live will affect your audience? Hopefully it won’t affect my audience too much. I managed to perform a 35 minute set at a lovely little cafe in my local town and the audience were simply stunning. I was very nervous as I had been out of the game for so long but they all put me at ease and were so supportive. Are you looking forward to returning to London? Very much so. I miss London terribly; most of my friends and family are in the Capital and I love playing shows there. I grew up in Walthamstow and I guess a part of me is still there… Choosing a University in London was my first step to moving back there but my ill-health got in the way of most of my immediate plans, alas. What made you choose to collaborate with Macka for Things Will Change? Well, Macka and I went to University together and he approached me one day asking if I would sing some songs a cappella for him to work on. I had seen his performances before and knew he was one of a kind; a guy who just has an amazing connection to his music and a real appreciation for. And your own music is available online – The Boulevard Tourist. How did you come about that name, and how would you describe the sound? The sound, I would say, is quite innocent. Someone once described it as pure… though I guess if I came up with that one I’d sound quite big headed. 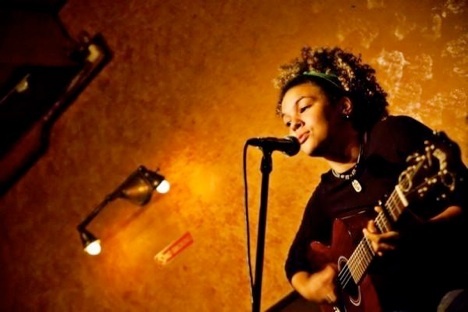 You’ve been known to perform Lauryn Hill covers – would you say she’s an important influence? Who and what else do you draw inspiration from? Miseducation was a massive album for me. Massive! Though I must say I hadn’t thought of Lauryn Hill as an immediate influence but I suppose she is really. A hugely talented black female artist and a great musical role model for me. The names that come immediately to mind are Joni Mitchell, James Taylor and Jackson Browne, Luther VanDross, Marvin Gaye and and all the other Soul Kings and Queens. I’m also greatly influenced by my friends; musical and otherwise. Outside of music, what do you do for fun? At the moment I’m concentrating on getting myself back on my feet, good and proper, like! So that consists of lots hard exercise; I also help my mother with her 6 horses which gets me out into the open countryside, which is no bad thing! Though, having said all this I must say that music is a huge part of my life. In fact, it IS my life! So I try and catch local shows and national concerts as often as possible. Especially to support friends. Well, you’ll certainly be hearing more from Macka and I, and I’m thinking of getting an album together… but first I’m working my way up to a great set of ‘comeback’ gigs in the London area. I’m really looking forward to playing music for the City again! Is there anything more you’d like to say? I’d like to say a huge thank you to everyone who supported me during my darkest hour, and to all the fans who send me lovely cards and fanmail wishing me a speedy recovery. I’m looking forward to seeing everyone again! Badcamp? Bardcamp? … Badcamp? Bandcamp? Bandcamp!